We will be displaying at the annual conference for the first time in 2016! We will be displaying in Booths 20657 and 20136 at the annual convention. Our Precision Box Targets were installed at Shot Spot’s state of the art indoor shooting and retail facility. Oakwood’s H-Bar Electronic Target System was tested and recommended by the members of the National Tactical Officers Association. The product review and stats will be listed on their online database and featured in The Tactical Edge journal in Fall 2015. Oakwood displayed at booth 1139 for the annual conference. Our H-Bar and Box Target systems were on display and available to shoot for all the competition shooters and Guardsmen at the National Matches. Pictures of the completion can been seen here via the NRA Blog by Kyle Jillson. AB Arms and Oakwood Controls welcomed Harris Publication and NRA’s Shooting Sports Magazine for a demo our system. Dead Air Armament, Liberty Ammunition and AB Arms and Oakwood Controls show their stuff a dozen or so industry writers. Check out https://lauraburgessmarketing.wordpress.com/2015/06/24/covert-shooting-ab-arms-modx/ for details. At this year’s show we will be introducing the shooting and firearms communities to new modules for our Quality Assurance system, a weatherproof model of our successful H-Bar and we will demonstrate how a shooter might utilize Google Glass with our portable target systems. Come visit us at booth numbers 20257 and 30307. Oakwood Controls H-bar was introduced to the International Association of Law Enforcement Fire Arms Instructors during their conference at the North Caroline Justice Academy in Salemburg, NC. Participants were giving the opportunity to try out the system and see its potential benefits to their departments. Oakwood Controls traveled to Mobile, AL to attend the annual National Tactical Officers Association’s annual conference. Our H-bar electronic target system was demonstrated and used during the association’s Tactical Precision Long Rifle course. Oakwood Controls returns to Camp Perry. For the second year Oakwood Controls four foot by four foot Box targets were used on the sight in ranges at Camp Perry prior to the NRA’s High Power Matches. Oakwood Controls portable Electronic Target Systems were showcased at three Precision Rifle Series Matches this summer. For more information on the Precision Rifle Series and the long range shooting competitions they put on, their website is www.precisionrifleseries.com. Oakwood completed the design and installation of an sophisticated ballistic coefficient measurement system for the US Government. This two-lane system was installed in an indoor tunnel and provides extremely accurate real-time ballistic coefficient and targeting data. Oakwood has been awarded a contract to provide a multi-lane production quality assurance target system for an overseas weapons manufacturer. Oakwood has partnered with MGM targets to provide a network of target systems for a research and development facility in Texas. Oakwood will have two booths at the 2013 SHOT show. Come visit us at booths 20226 and 2964. Come visit us in Booth 20226 at the SHOW Show in Las Vegas — the world’s largest trade show for professionals involved in shooting sports, hunting, law enforcement and military industries. We will be showcasing the latest updates to our Electronic Target Systems. Both long-range portable precision systems as well as manufacturing/R&D systems will be displayed. Oakwood was recently awarded a contract for modeling and simulation of sensor applications. The work will be performed for the US Army RDECOM Night Vision Labs. The contract, which has a ceiling value of $1.4M, was awarded by CACI Technologies, Inc. via its S3 Program. The US Army Night Vision & Electronic Sensors Directorate, via CACI Technologies’ S3 Program, awarded Oakwood Controls a contract for research, development, engineering and systems integration support for various LVC simulation applications. The contract has a ceiling value of $2.45M. The Naval Special Warfare Group Four has contracted with Oakwood Controls to provide a large system of portable electronic targets for precision long-range small-arms training. Gordon Miller, of Oakwood Controls, is presenting at SPIE 2010. He will be discussing a number of the core philosophies behind the SIU design. 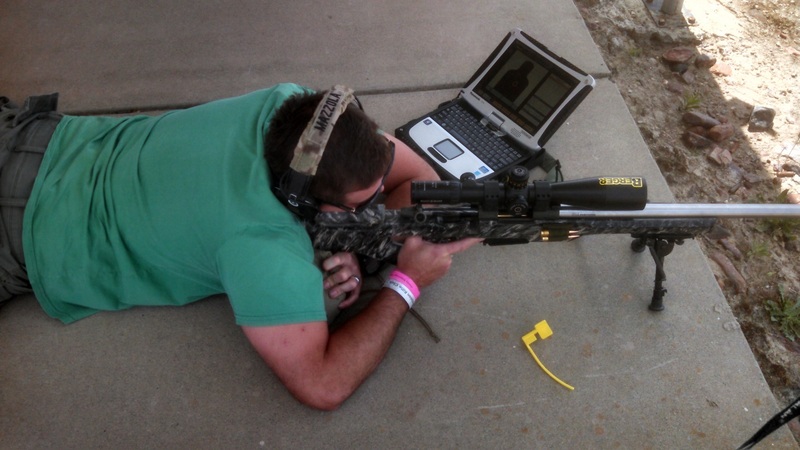 Oakwood Controls demonstrated its electronic target system at the 2010 Sniper’s Hide Cup, held in Kingsville, Texas. The SH Cup is a three-day event for long distance tactical shooters. This year, over 60 shooters competed over a three day period for prizes totalling over $100,000. Oakwood Controls has launched a new and improved website. Oakwood Controls has several electronics projects. We are seeking a part-time or project-basis engineer to work on these projects. Come see Oakwood Controls and its latest Electronic Target System at the SHOT Show in Las Vegas. We are located in the MGM Targets Booth #20439. Oakwood Controls is happy to be part of the EOIR Technologies team that has been awarded a 2-year contract to support the Night Vision and Electronic Sensors Directorate (NVESD) with software engineering services. This contract has a $5M ceiling value. Oakwood Controls announces the first live-fire, precision training system for weapons equipped with thermal imaging scopes. Oakwood Controls announces the availability of its ETS-1000 — an innovative electronic target solution for long-range precision shooting and training. Oakwood Controls announced today that CACI International has awarded a $2.8M subcontract to support the Night Vision and Electronic Sensors Directorate (NVESD), a US Army center for research and development. This contract has a one year initial period of performance with two option years. Oakwood Controls is looking for software engineers. Oakwood Controls announces the availability of its Sensor Interface Module.